This week's Quick Tip is about using your shaper to get a blended gradient over a rough surface in a short time. The technique is similar to drybrushing, but the shaper has the advantage of not destroying the brush, being a little more precise and not giving a powdery look. I used this technique on the base of my Fuegan model for the glow coming from a freshly Fire Axe cut Black Templar banner. Since then I've worked with the technique more and here are some important tips for getting the best results. First, I recommend using the Foundation paints. You'll want a paint that is a little thicker and still covers well when spread and I've found that the Citadel Colour and other thinner paints that work well for normal blending just don't hold up to the physical manipulation over a rough surface. Second, like any painting technique, finding the proper consistency is key. For this technique I work with the Foundation paints a little thicker than I normally do. I always wet my brush before touching paint but in this case I use my fingers to squeegee most of the water out of the bristles before picking up some paint. Third is to practice. The technique described is similar to drybrushing or overbrushing, but because the shaper is new to me it takes a while to get a good feel for how it picks up paint and moves it around. The best part about this technique is that it is really fast. You'll have to excuse the over the shoulder angle of these pictures because if you keep the paint on too long it will dry out and not move when you hit it with the shaper. I used a #0 Cup Chisel shaper in these pictures and Mechrite Red, Macharius Solar Orange and Iyanden Darksun as the colors. The base is a GW plastic flying base with a mixture of sand and small rocks and the whole thing (front and back) has been primed black and left to dry completely. Start by laying down a fairly thick stripe of red. You won't want it to flow into the cracks, so if the paint won't stay on top of your texture you've got it too thin. Put the brush down right away and grab your shaper. I start by pulling across the stripe of paint for about 1 cm to create the "field". After the initial pull is done, I work in shorter quick strokes to fill in the first half of the field and help define the shape. Next lay down your next color behind the first stripe and repeat the technique, shortening the field for each color. The final color goes down just like the others. Remember to work quickly once you put the paint down as the shaper spreads the paint and makes it dry faster. Different types of gradient are easy to make by varying the shape of the initial stripe and how you layer the consecutive colors. In the rounded gradient on the right I made each consecutive color strip shorter than the last. The large gradient on the left was made by laying down all three striped and once and working from the red stripe back towards the yellow: spread the red first, then grab the orange and pull it across the red and finally pull the yellow across the other two. The red in the upper right corner was applied too thin and didn't leave enough paint on top of the texture to pull with the shaper. Like I said this technique really works best when you do it quickly. You only have a short time to move the paint with the shaper but you can finish a base really quickly. 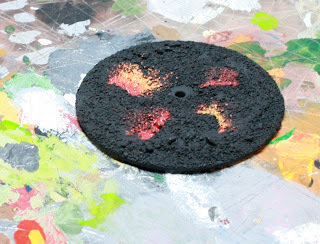 I figure that using this technique to create lava bases for an entire army wouldn't take any more time than normal basing. In fact since you are using only paint and it dries quickly once spread, it might even be faster than waiting for the glue on static grass to dry. What new tips have your experiments with the shaper yielded?